Source: Missionary Album of Missionaries Serving under the Board of Foreign Mission of the Mennonite Brethren Conference, 1954. 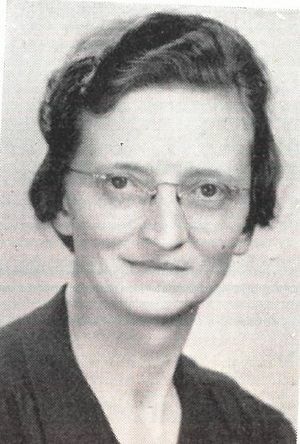 Kathryn "Katharina" L. Willems: missionary and translator in the Congo; born 16 September 1907 in Reno County, Kansas, USA to Peter D. (27 June 1882-21 April 1959) and Helena "Lena" Block Willems (21 September 1885-8 March 1909). Kathryn was a missionary and translator in the Belgian Congo (later Zaire) for forty-two years. She died in Hillsboro, Kansas on 9 May 2006 at the age of 98. Kathryn was the elder of two daughters born to her parents in a family that eventually included six more children from her father’s second marriage. She became a Christian at the age of 14 and began dreaming of becoming a missionary nurse to China by the time she was 15 years old. Kathryn was baptized on 18 June 1922 and joined the Zoar Krimmer Mennonite Brethren Church in Inman, Kansas. The family later moved to Corn, Oklahoma, where Kathryn graduated from the Corn Bible School in 1927. In 1935, she graduated from high school at the Corn Academy and Bible School. During her time in Bible school, Kathryn began to reconsider her plan to work in China when she met Martha Hiebert, a missionary to the Belgian Congo who was also studying at the Corn Bible Academy. The stories that she heard convinced Kathryn to alter her plans, and she applied to the Mennonite Brethren Mission organization to serve in Africa, setting out for her first term in 1936. With the exception of a few breaks for furloughs, studies, and other purposes, she spent the next 42 years serving the people of Africa. Much of the work that Willems did over the next years was in the area of Bible translation and literature preparation. Following intensive study of the Kituba language, Kathryn worked together with others at the Kafumba station and in the capital city, Kinshasa (formerly Leopoldville), to produce materials, including the first translation of the New Testament in that language, as well as several Old Testament books, the North American Mennonite Brethren Confession of Faith, and supplementary materials. She translated songs, compiled a Bible dictionary in Kituba, and also wrote Bible lessons for the local people. After her first term in Africa, Willems returned to the United States to study at Tabor College in Hillsboro, Kansas. She graduated with a theology degree in 1943 before returning to Africa to work. Although the country’s revolution in 1960 disrupted many activities in the area, Kathryn continued her work of translation. In the early 1970s, she had to return to the United States for three years due to illness, but even then she continued to work on compiling a Kituba-English dictionary. During this time, the church also received official government acceptance as the Zaire Mennonite Brethren Conference (later the Communauté des Églises de Frères Mennonites au Congo), a development that Kathryn had promoted. Following her recovery, Kathryn returned to Africa, remaining for her final overseas term from 1974 to 1978. She moved back to the United States and settled in Hillsboro, Kansas, where she continued to do translation work as long as she could. Failing eyesight finally made this work too difficult to continue, and she retired after completing her last assignment in 1983. She died on 9 May 2006 in Hillsboro, Kansas, at the age of 98. Kathryn Willems was a dedicated and persevering mission worker who used her language skills to make the Bible and other written materials accessible to the people of Africa. Her long-term commitment to the Kituba translation project, despite all of the troubles that she encountered, was exemplary. Faber, Connie. "Translator Remembered for Service to Congo." Christian Leader 8 (August 2006): 31. (vol. 69). GRANDMA (The Genealogical Registry and Database of Mennonite Ancestry) Database, 4.19 ed. Fresno, CA: California Mennonite Historical Society, 2005: #14158, #315323. MBMSI Global Bridge. "3 missionaries remembered for service." September 2006. Web. 13 April 2016. http://www.mbherald.com/45/11/people-3.en.html. Missionary Album of Missionaries Serving under the Board of Foreign Mission of the Mennonite Brethren Conference, Inc. October, 1954. Hillsboro, Kansas: The Board of Foreign Missions, 1954. Obituary. "Helena Block Willems." Mennonitische Rundschau 21 (26 May 1909): 4. Obituary. "Margaret Krahn (nee Dyck)." http://www.wiebefuneralhomes.com/w/index.php?option=com_content&view=article&id=1684%3Amargaret-krahn&catid=58&Itemid=80. Toews, J. B. The Mennonite Brethren Church in Zaire. Fresno, California: Board of Christian Literature of the General Conference of Mennonite Brethren Churches: 1978: 51, 76, 79, 174, 235. Huebert, Susan. "Willems, Kathryn L. (1907-2006)." Global Anabaptist Mennonite Encyclopedia Online. April 2016. Web. 19 Apr 2019. http://gameo.org/index.php?title=Willems,_Kathryn_L._(1907-2006)&oldid=134674. Huebert, Susan. (April 2016). Willems, Kathryn L. (1907-2006). Global Anabaptist Mennonite Encyclopedia Online. Retrieved 19 April 2019, from http://gameo.org/index.php?title=Willems,_Kathryn_L._(1907-2006)&oldid=134674. This page was last modified on 22 June 2016, at 03:42.